Angelic Keys captures the heavenly tone of a 53-key spinet harpsichord, also known as a virginal. The spinet harpsichord has a much quieter sound than a full-size harpsichord. Its pureness of tone is due to the fact that each key plucks a single string rather than unisons (multiple strings tuned to the same pitch to increase the instrument's volume). Because of its quieter tone, the spinet harpsichord also lends itself to smaller ensembles and makes it easier to blend in your mix. We've included the close and far mic positions as separate signals so that you can customize the sound of the instrument. For added realism, we made sure to preserve all the resonance and every buzz in the releases to recreate the true character of a spinet harpsichord. 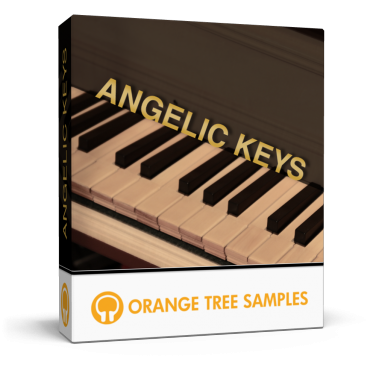 Whether you're writing 18th century classical music or hipster singer-songwriter tunes, Angelic Keys will make a great addition to your sound palette--and at a price that won't make you go baroque! - Blend together separate close and far stereo mic signals for your own mix. - Traditional "as is" as well as chromatic key mapping layouts. - Equal temperament and just intonation and any amount in between these two tunings. This product requires a total of 1.8 GB of free disk space in order to download and install the sample library. The total size of the download is 915 MB, and after installed the library occupies 930 MB.